When we posted our first blog on July 27, 2010, called “The Sounds of Paris,” we had fairly simple objectives. We wanted to use our photographs of Paris, our shelf of books on the city, and our small collection of antique postcards. We wanted to share some of the things we had found (or found out) during our visits. And, finally, we wanted to answer some of the questions that nagged us. How does the Paris street cleaning system work? What is that long-lost building in a turn-of-the-century postcard? What is the human story behind this artwork or that memorial? In the past 100 posts, we’ve covered everything from a clumsily executed murder to bouquinistes by the Seine to chimneypots and the finer points of parking. 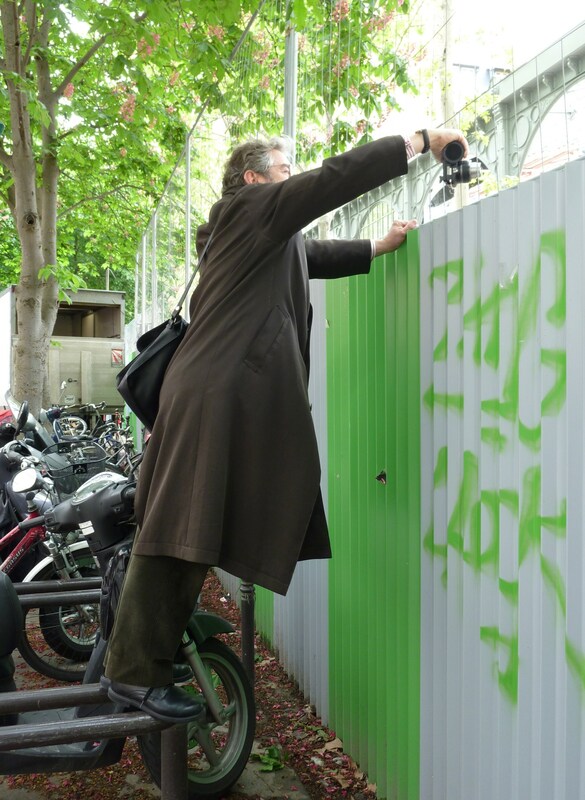 We sometimes set out to write about one thing and end up writing about another – rather like our wanders in Paris. We set out to see something and then one of us says, “I wonder what is down that street?” and one thing leads to another and our original destination is left for another day – or another trip. Not much has changed after 100 blog posts, although we have more photographs than ever, more books, and a lot more antique postcards. We both take photographs, although Norman has a better eye and a better camera. Here he is, aiming for the perfect shot, whatever it takes. We both do research, although Philippa is more obsessive and is more comfortable reading French. 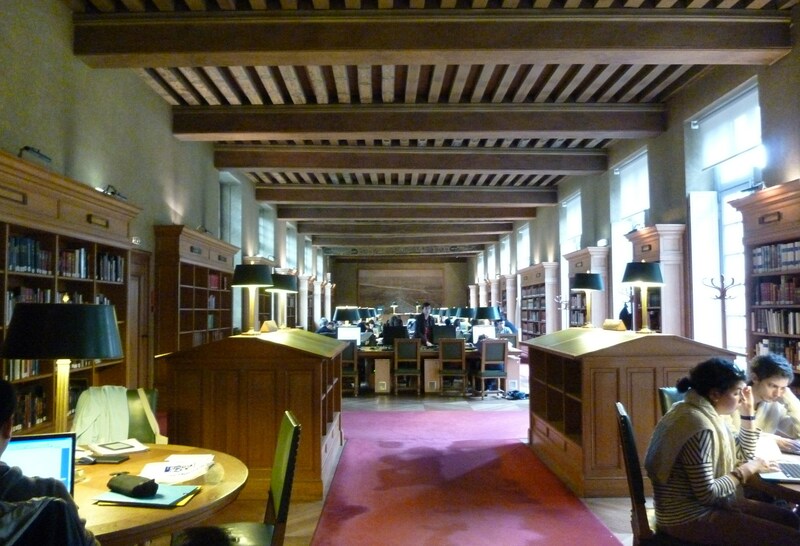 Here is a photograph she took (a bit hurriedly) on her visit to the Bibliothèque Historique de la Ville de Paris in spring 2012. And we have friends, too many to acknowledge individually, who provide inspiration and support and hospitality. 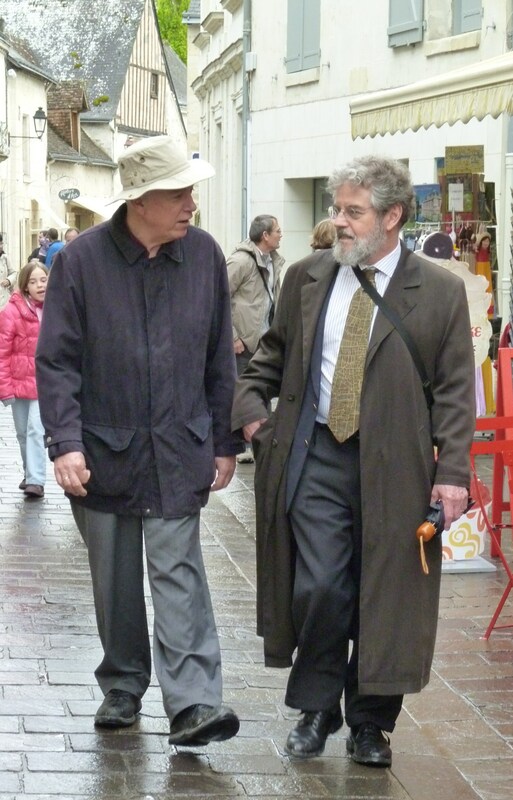 Here, for example, is Norman walking in Tours with Paul Davenport, an economic historian and former university president who teaches about Impressionist Art – we’ve signed up for his next course, which starts this coming week, at the University of Toronto. 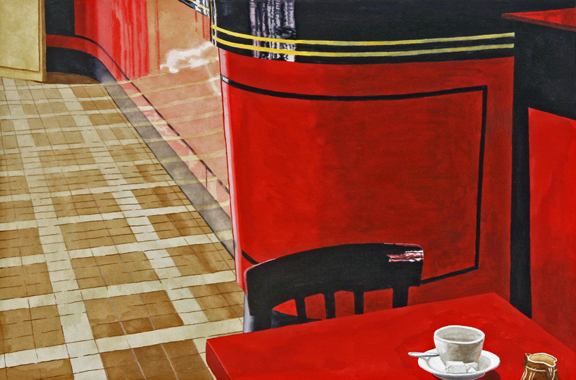 And here is some art by Richard Ewen, our man in Texas, which formed the basis of a particularly popular blog post. And we would be remiss if we did not acknowledge the support of two fellow bloggers: Adam Roberts of Invisible Paris, who never fails to inspire us with his on-the-ground knowledge and research skills, and Doni Belau of Girls’ Guide to Paris, who encouraged Philippa to create two walking tours as well as several articles for her site. Of course, we are leaving out so many others who have cheered us on the way, from family members to complete strangers, who take the time to comment and to encourage our efforts. Please know that we read every word and appreciate every suggestion. WordPress provides statistics on our progress. We know that the all-time most-visited posting on Parisian Fields is our “Guide for Visitors to Paris,” in which we offer the advice that we always give to friends who are about to visit the city. 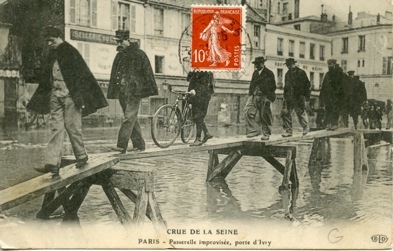 The next on the list is “Finding Paris in old postcards” followed by “Finding the world in Paris postcards.” Clearly we are on to something with antique postcards. People want to buy them, study them, learn about them, find new stories in them. Postcards are rich sources of information and stories. We dramatically expanded our postcard collection on our last trip (April–May 2012) with a visit to the Old Paper Market at Saint-Mandé, just outside the Périphérique on the west side of the city. It was raining (it rained a lot that trip), but the stalls were covered and there were riches to be found. While Philippa carefully searched for items on her wish list (she’ll buy anything showing the Dufayel Department Store or ads created by Dufayel), Norman wandered along the row of dealers. He was amazed to see a large box containing hundreds of assorted Paris postcards listed for 59 euros (the lot). He spoke to the man. Whatever he said was magic. The price came down to 50 euros. He bought it on the spot. When we came home, it took many evenings to sort out the contents of that box, but we found some treasures. Some are earmarked for future stories, but here are two that caught our attention. Postcards of Paris monuments are a dime a dozen, but postcards of ordinary Paris streets are more unusual and interesting. Here is one of the rue du Ranelagh in the 16th arrondissement. This was the street that Philippa lived on when she was a student and au pair to a French family. This shot shows the intersection with rue Davioud (someone has helpfully written it in), a few blocks west from the building she lived in (No. 28). We particularly like the fact that this postcard has been used (pristine, unused postcards are less interesting). The text on the picture side, in childish handwriting, says, “Thank you for the pretty ring. It suits me. I send a big kiss to Grandfather and Grandmother. Anaïs.” It was posted in August 1905 in Auxon, in the department of Aube. The address on the other side is written in a more adult hand. There is a name, but no street address, and it was going to Kemplich in Lorraine, a region that at the time was part of the German Empire, having been taken over in 1871 at the end of the Franco-Prussian War. 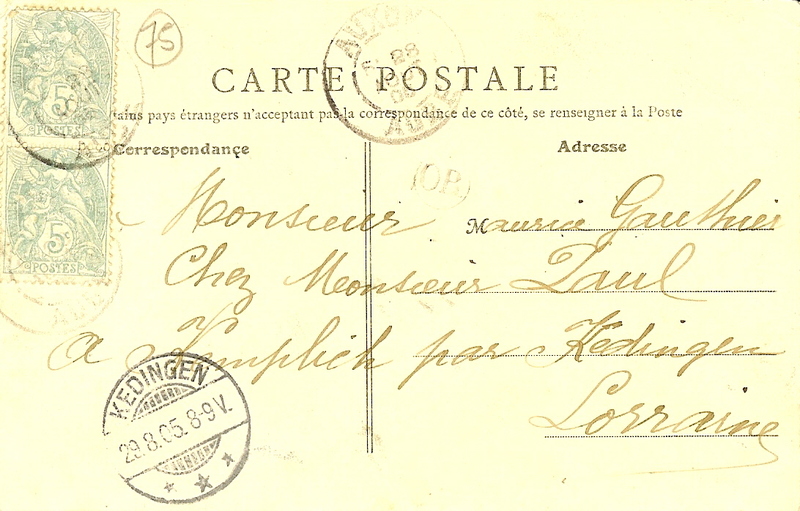 The card had to go through Kedingen in Germany to reach its destination, and there is an extra postmark that indicates this step in the voyage. Little Anaïs’s family was divided by a border. 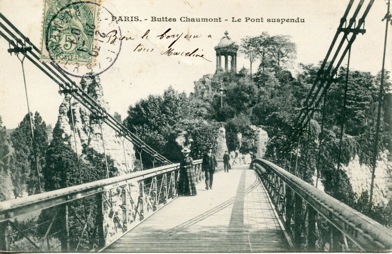 The St-Mandé box also yielded a postcard of one of Norman’s favourite haunts – the Hotel de Sens, home of the Bibliothèque Forney in the Marais, where he has spent many happy hours browsing collections related to the decorative arts, and their postcard files, which include cards written by French people visiting Niagara Falls in Canada. Note that in this picture, this extraordinary 15th-century building is being used as a commercial premises – a glassworks (Verrerie Haroux). 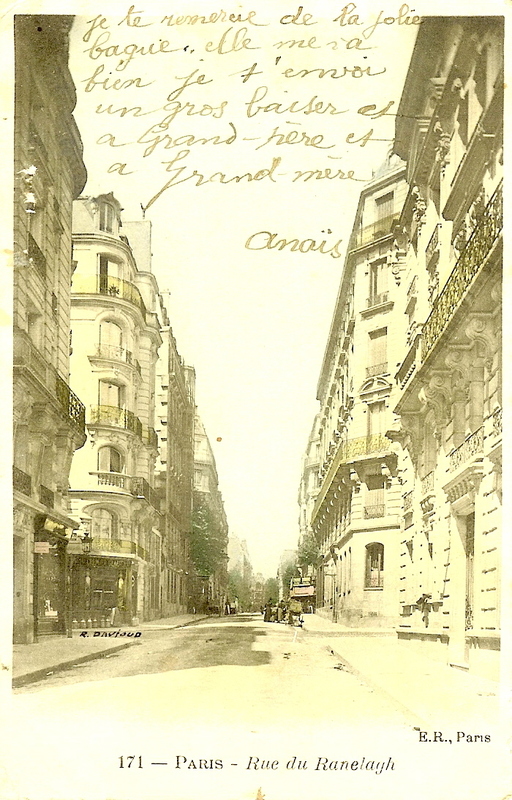 It dates from about the same time as the Anaïs postcard. We know that, because in 1899 Eugene Atget photographed it looking as it does here. 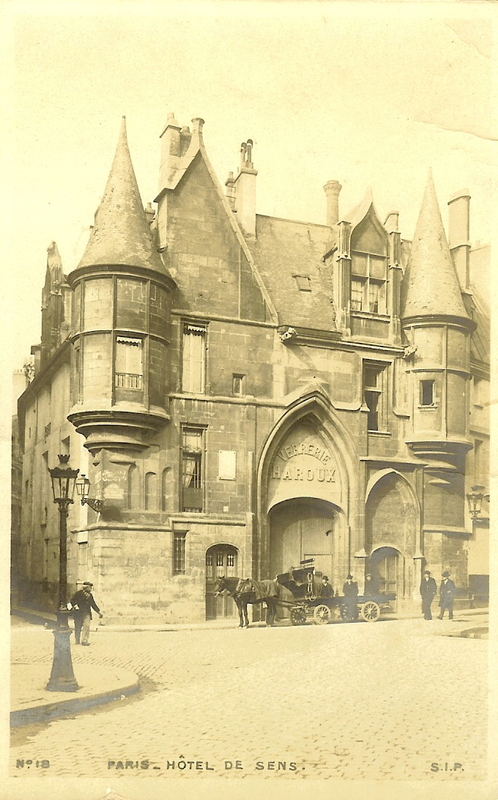 Back then, the Marais was the haunt of artisans and fabricators of all kinds. The trendy boutiques and respectfully restored historic houses came later. Alas, nobody has used this postcard, so there is no story to tell about the sender or recipient. There is something about holding a postcard that has been sent from one person to another more than 100 years ago that makes you feel close to history. Did Anaïs survive the First World War? Did her family? Were they around to celebrate the return of Lorraine to France? Or had they perished in those four ghastly years? In the course of researching, writing, and choosing images for 100 blogs, we have stumbled across countless stories of long-vanished people and their friends and families. Traces of their lives and passions survive in these scraps of pasteboard. Will anyone ever trace us through our e-mails and text messages, or have we vanished more permanently than Anaïs and her grandparents in 1905? Send your postcard from a favourite place, a place where you like who you are when you are there. That is why we keep going to Paris as often as possible and why we write about what we find in this magical city. We hope you enjoy our blogs, 100 of them and counting, as much as we enjoy putting them together. This entry was posted in Paris markets, Paris postcards and tagged Adam Roberts, antique postcards, Bibliothèque Forney, bibliothèque historique de la ville de paris, Doni Belau, Eugene Atget, Franco-Prussion War, Girls' Guide to Paris, Hotel de Sens, Invisible Paris, Les Grands Magasins Dufayel, Lorraine, Marais, Marche aux Vieux Papiers, Paul Davenport, postcards, Richard Ewen, rue Davioud, rue du Ranelagh, St-Mandé, Verrerie Haroux. Bookmark the permalink. What a great find! And it couldn’t have gone to a better couple – congratulations. I am a fairly recent follower of your blog and whenever I find time to come to visit you I find some treasures and beautiful descriptions of something I either adore too or didn’t know at all…. May many more hundreds of posts come along our ways and may my thanks give you a modest happiness. Merci beaucoup. I love everything you write about….and Post Cards are a fascination for me also ! Centenarians. Well done. My favourite post was the one in which Philippa traced the routes in one of my fave films of all time: ‘How to Steal a Million’. Yes, it was a lighter and more frothy entry but it spoke volumes and I keep it in a special folder and reread it each time we watch the film which is about once a year for, like the Alastair Sim ‘A Christmas Carol’, it’s timeless and classic and the effect is always ‘feel good’. So is that post. That said, there have been many, many other beautifully and whimsically written and illustrated posts. Both are vital, for without the vibrant combination, text alone would turn into black and white words on a screen: uncaptioned photos would mean little or nothing. The whole is whimsical and the standard remains stratospheric. Keep it up, both of you, and thanks for many wonderful reads. My first few summer visits to Paris and St. Mammes in the early 90s I brought with me blank watercolor paper post cards and posted back home little watercolors of the canal boats and village gates and riverside strolls. I also began collecting old cards I found in many village markets and in a couple shops in Paris in the shopping arcades. My collecting usually featured many village scenes of Burgundy and the Ile de France where I was exploring. Congratulations on your 100th issue……I am thankful and proud to have been a small part of it. I look forward to many more interesting articles. And Norman, watch your step when you are after that hidden photo! Many thanks! That picture of Verrerie Haroux is tremendous! Happy Hundedth! May you write many more posts (with many more photos) and find many more postcards. Congratulations on reaching 100! I see now that you two are indeed our modern-day Eugene Atgets. Congratulations – and not a word wasted in 100 posts. The thanks and appreciation are of course mutual! Bonne anniversaire! Creating a successful blog is very difficult indeed, but the two of you have done it with panache. 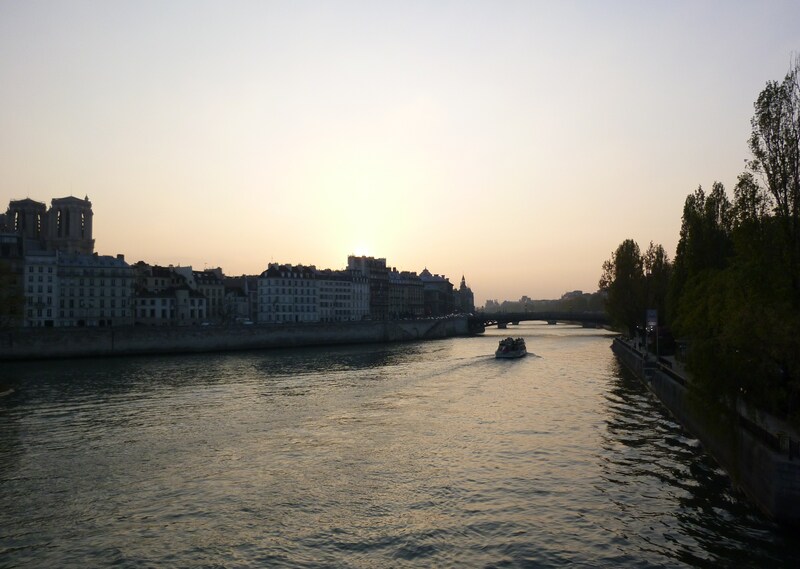 I have enjoyed reading and learning more about Paris over the past 100 blogs, and look forward to continuing to do so in the hundred(s) ahead. I really enjoy reading your blog – I particularly love the posts on street architecture – manholes, lights, pipes, and so on. The little but beautiful things one might not necessarily notice. Here’s to 200, 300, and beyond! The Hamilton branch of the Ball family very much hopes to visit with you one day the Paris you describe. Croissant with Grandpa in Paris would certainly be a highlight of Emmanuel’s life. We love the blog.